Science is awesome. And thanks to the internet age, it's easy to be witness to that fact. For example? 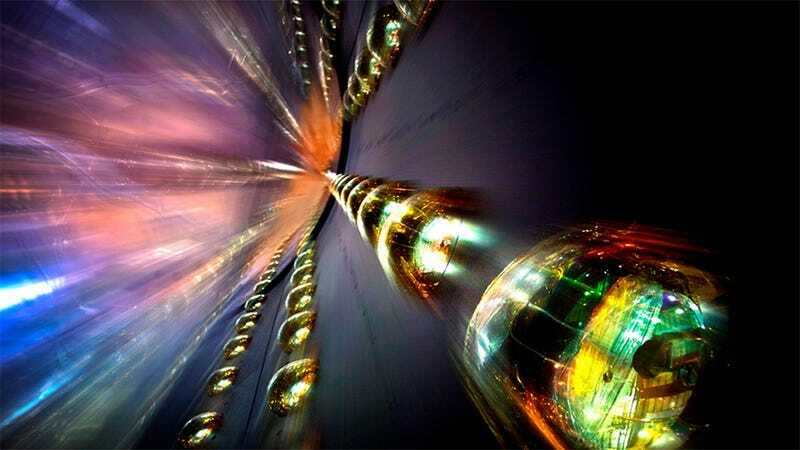 This beautiful image of the photomultiplier tubes in the Daya Bay Neutrino Experiment detectors, which mesmerized millions when it started circulating online this week. However, some of us questioned what we saw, asking how the image could possibly be real. So for your viewing pleasure—and for the skeptics out there—here is a collection of similarly huge and fantastical scientific experiments and machinery. Photomultiplier tubes inside the Daya Bay neutrino detector, a multinational particle physics project studying neutrinos, at the reactor complex in Daya Bay, China. Super-Kamiokande, a large Cherenkov detector operated by Japan, the United States, Korea, China, Poland and Spain. The detector is located 3,000 feet underground in the Kamioka-mine, Hida-city, Gifu, Japan. The ATLAS (A Toroidal LHC Apparatus) particle detector experiment, constructed at the Large Hadron Collider (LHC), a particle accelerator at CERN in Switzerland. The Compact Muon Solenoid (CMS) experiment, one of two large general-purpose particle physics detectors of the Large Hadron Collider at CERN. The Sudbury Neutrino Observatory (SNO), exterior and interior. It is located more than a mile underground in Vale Inco's Creighton Mine in Sudbury, Ontario, Canada. The Borexino Experiment, located at the Laboratori Nazionali del Gran Sasso near the town of L'Aquila, Italy, measures the solar neutrino flux and its day/night asymmetry. The late Cockcroft Walton generator of Fermilab. Sadly, it's been decommissioned. The Z machine, or the Z Pulsed Power Facility, is the largest X-ray generator in the world, designed to test materials in extreme conditions. It is located in Albuquerque, N.M., at Sandia National Laboratories. The electromagnetic pulse causes impressive lightning when the machine is discharged. Gammasphere, a gamma ray detector at Lawrence Berkeley National Lab. Inside the Joint European Torus (JET) vessel, the largest tokamak in the world, which investigates the potential of fusion power at the Culham Centre for Fusion Energy, Oxford, England. The interior of the target chamber of the National Ignition Facility (NIF), the world's largest laser, located at Lawrence Livermore National Laboratory. The James Webb Space Telescope's primary mirror segments in the cryogenic testing chamber at NASA's Marshall Space Flight Center. The Large Diameter Centrifuge (LDC) at ESA's European Space Research and Technology Centre (ESTEC) at Noordwijk in the Netherlands. Inside the Large Space Simulator at ESA’s test centre in the Netherlands. Are there any other amazing scientific machines missing from this collection? Show us in the discussion below!